There is a word in the Hawaiian language, mana, that I’ve come to find very useful because there is no exact equivalent in the English language. Mana means spiritual power or authority, the mystic and God-given force of a strong, integrated personality or group of people. Just to use a frivolous example that most people can identify with, consider what happens when you don your team gear and gather to cheer on your favorite sports team. Such an activity is meaningless on the face of it; how can you, as a fan, affect the outcome of the game? Yet we feel that we do, by lending our own mana to the cause. When a person’s mana is strong enough, even their belongings and the places associated with them seem to reverberate with their life force. For those of us who enjoy history tourism, there is nothing better than finding a place strong with the mana of the individuals that we’ve studied and come to know and love. And if you want to take in some Clark family mana, Louisville, Kentucky is your kind of place. The Belvedere, also called Riverfront Park, is a great place to begin exploring Louisville (usually pronounced Looavull). We stayed at the Galt House, a very nice downtown hotel, which is directly adjacent to the waterfront. The Galt House has gone through many incarnations. In fact, William Clark’s grandson, Meriwether Lewis Clark , was shot in one of them. “Lutie” Clark was the founder of the Churchill Downs race track, the future home of the Kentucky Derby. Known to history as an overbearing bully of a man, he was shot but not killed in an 1879 fight with a horse breeder. The current incarnation of the Galt House dates from 1971 and has a personality unlike any other upscale hotel I have ever stayed in. My private affectionate joke is that, like the city of Louisville itself, it displays the perfect combination of northern charm and southern efficiency. All kidding aside, unless you’re the uptight kind of traveler, you will find it well worth the money — warm and comfortable, laid-back, full of nice people, and entirely Louisville. 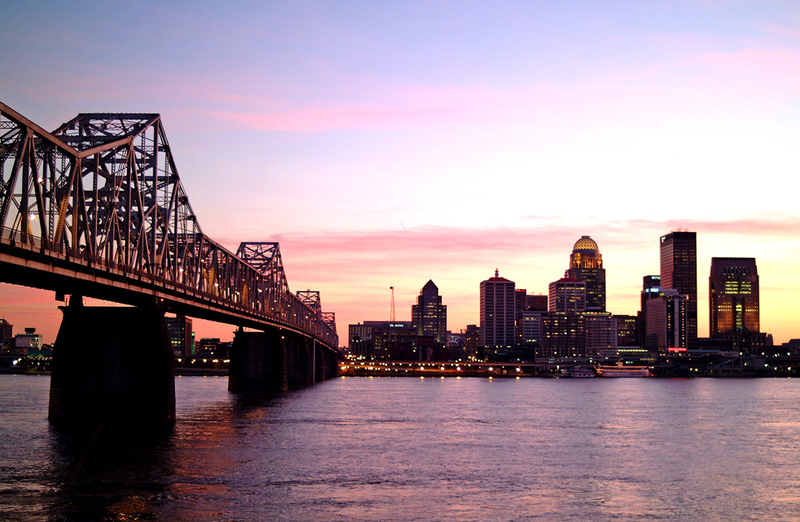 Louisville was founded in the spring of 1778 by George Rogers Clark, the older brother of William Clark. Then just 26 years old, George had recruited about 150 men from Virginia and Pennsylvania into a covert expeditionary force that later became known as the Illinois regiment. Together with about 80 civilians, Clark and his men came down in May 1778 from Pennsylvania and landed at the Falls of the Ohio, an area of tumultuous rapids that formed a natural barrier to navigation and a natural defense. The presence of the settlers helped Clark conceal his true purposes, for he carried secret orders from Virginia Governor Patrick Henry to lead a strike deep into British-held territory in the west. Before beginning operations, the regiment was able to help the settlers get set up on Corn Island in the middle of the Ohio, just opposite the Belvedere (the island is now underwater). This was the founding of the settlement that became known as Louisville, named after King Louis XVI of France, a major supporter of the American Revolution. 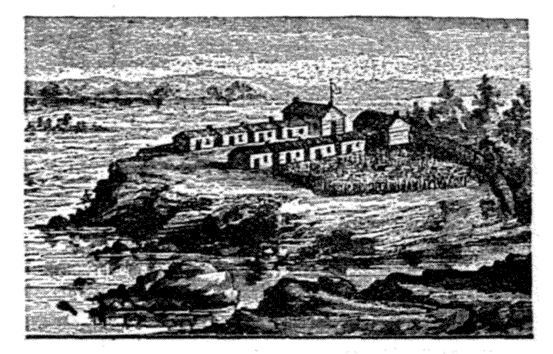 A stockade on the mainland followed within a few months. A few weeks after arriving at Corn Island, Clark and his men disguised themselves as Indians and headed downriver in canoes to begin their legendary exploits. 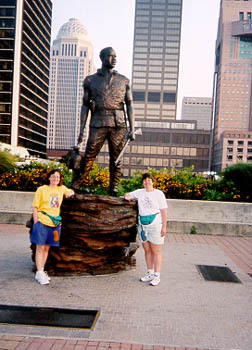 George Rogers Clark is a major character in our book The Fairest Portion of the Globe (due out next month!) and his heroics and their incalculable effects on the future of the American west are slated for some upcoming posts. After the Revolution, George decided to make his home at the town he had founded, and persuaded most of his huge family to move from Virginia to join him. The Clarks and their relations were soon among the leading families of a sprawling, brawling frontier river town. 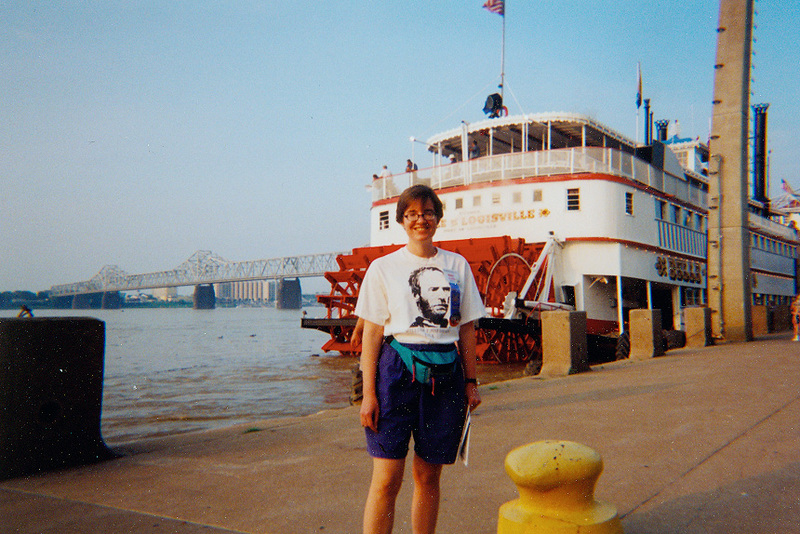 The Ohio river is, in fact, the defining feature of Louisville. The first time I ever came to Louisville, I was blown away by the might and sheer size of the river as it muscles its way between Kentucky and Indiana on the other side. Being from Texas, where most rivers are shallow and non-navigable for any distance, this was my first time to realize what a truly great and historic waterway looked like. This powerful river, one of the interstate highways of early America, linked Louisville to the rest of the country and made possible its eventual growth into one of America’s great riverport cities. Even if you only have a few minutes when passing through Louisville, it’s a wonderful treat to stick your car in the parking garage a while and take some time to stroll and gaze upon La Belle Riverie (“the beautiful river”). 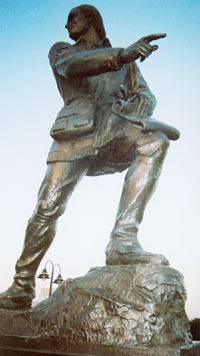 George Rogers Clark statue, by Felix de Weldon. George Rogers Clark was the author of some of the greatest feats of the American Revolution. Thanks to the young military genius, the United States emerged from the Revolution with possession of the American frontier and the ability to expand far beyond the territory of the original thirteen colonies. So why isn’t he better remembered today? Probably because of the royal screwing he received from the Founding Fathers. George’s thrilling, then tragic story is a major thread in The Fairest Portion of the Globe. York statue, by Ed Hamilton. York is the now-famous African-American manservant of William Clark, who joined the Lewis & Clark Expedition and became the first person of his race to cross the continent. Lewis and Clark’s journals reveal that the social barriers that defined York’s life in Kentucky quickly broke down in the wilderness, and that York took his place as a full-fledged and equal member of the Corps of Discovery. As a member of the Corps, he was courageous, dependable, and caring. But ultimately, York’s saga was also a tragic one. When the Expedition returned to civilization, York demanded freedom, the chance to live near his wife and family, and the chance to start his own business and rise or fall on his own efforts. William Clark was, quite simply, appalled. The breach between master and slave is a major story line in our first book, To the Ends of the Earth. The Belle of Louisville. The great era of steamboats may have only lasted a few decades, but retains its hold on the American imagination. Here is your chance to get out on the Ohio River on a real historic steamboat. The Belle of Louisville began life as the passenger ferry Idlewild in 1914 (meaning its centennial celebration is just a few years off!). Her name was later changed to Avalon, and she was just days from the scrap heap in 1962 when Jefferson County officials swooped in to buy the steamer and give her new life as the excursion boat Belle of Louisville. The sound of the steam calliope calling passengers to the waterfront is irresistible! We took a very fun evening ride on the boat and enjoyed the narrative and the chance to see more of the river landscape very much. The Louisville Metro government also operates the Spirit of Jefferson, a replica steamboat that is not as old but looks equally fun! There are a lot of places to eat in downtown Louisville. A fun place before or after your stroll on the Belvedere is Bearno’s Pizza (about a block east of the Galt House). This would have been a good place for Clark to treat the Corps of Discovery — a medium pizza was more than the two of us could eat! Though given that the Corps’s hunters strove to provide some nine pounds of meat a day per man … Clark would probably need to order at least 50 super-large Mama Bearno’s specials for his ravenous crew. Wonder what Bearno’s would do when Lewis tried to pay with Mr. Jefferson’s unlimited letter of credit? Wow, I did not know that William Clark’s older brother founded the city of Louisville! I’ve been there once and really enjoyed it. I don’t know much about Clark’s family, but I guess being a history buff, you are always learning! Thanks — needless to say, I left it home when I went to Atlanta!